If you didn’t see the post on Bean Talk this morning…we’re conducting our first contest! 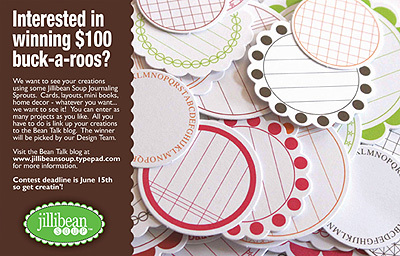 We want to see your projects using Jillibean Soup Journaling Sprouts. Cards, layouts, mini albums, home decor – we want to see it all. All you have to do is link up your projects to the Mister Linky link on the blog. The winner will be picked by the Jillibean Soup design team and the winner will be awarded $100 USD!! Quick….the contest ends on June 15th! Get your creative hats on! !